Following on from the previous two posts about starting up a photography business, post one and post two, we now cover adding the detail to your business model. The three choices, highlighted above, together, create a configuration that is permanent. The individual business model components may undergo constant incremental change. Wholesale, radical change of any one element (e.g., serving an entirely new customer group) will be inhibited by the other two model elements. While each element is a necessary (but not sufficient) component of a business model, the three are not equally important. Business models are built around customers. They’re the most important element. Without a compelling value proposition, there are neither revenues nor profits. 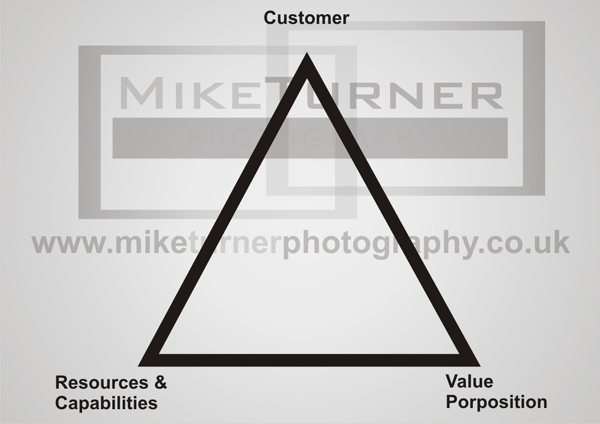 Resources and capabilities are strategic only to the extent that they fulfill the promises (explicit and implied) made to the customer through the value proposition. 1. Customer – who will the business serve? – for instance families, teenagers, maybe schools, businesses via product shots or covering events. Think about how frequently customers come to buy from you and the value as a proportion of sales that each contributes. A good mix of high frequency, lower value and low frequency, higher value is something we aim for. 2. Value proposition – “offer” that will be made to the customer. Marry experience, with a physical product at the end of it. Barrier to entry lays in the expertise and relatively med/ high capital costs of getting such a business started. some examples include Photographer skill and expertise (which is still the key ingredient) and equipment, Studio facilities, Graphic designers and equipment, Framers and framing equipment, Stylists and hairdressers providing services providing support services, Clothing suppliers – ball gowns, evening dresses, wedding dresses. All these points need to be considered when looking to start your own photography business. Doing your own research is critical, preparation, preparation, preparation is as important as location, location, location.